VANCOUVER, CANADA -- Kaizen Discovery Inc. (TSXV: KZD) and AM Gold Inc. (TSXV: AMG; Frankfurt: AMX) jointly announced today that they have entered into a definitive acquisition agreement that will provide Kaizen with 100% ownership of the Pinaya Copper-Gold Project (the Pinaya Project) in Peru's provinces of Caylloma and Lampa (see figure 1 below). The Pinaya Project contains Mineral Resources within three zones that are essentially contiguous over a 1.7-kilometre strike in the central part of the property. The Western and Northwestern porphyry zones hold estimated Measured and Indicated Resources of 32.3 million tonnes at 0.39% copper and 0.44 grams per tonne (g/t) of gold, for contained metal of 280 million pounds of copper and 452,000 ounces of gold. These porphyry zones also have additional Inferred Resources of 35.4 million tonnes grading 0.40% copper and 0.27 g/t gold, containing 314 million pounds of copper and 307,000 ounces of gold. The Gold Oxide Skarn Zone has Measured and Indicated Resources of 6.4 million tonnes at 0.80 g/t gold and 0.092% copper, containing 164,000 ounces of gold and 13.0 million pounds of copper. This zone also has an additional Inferred Resource of 2.38 million tonnes grading 0.60 g/t of gold and 0.081% copper, containing 46,000 ounces of gold and 4.3 million pounds of copper. Previous drilling on the property was focused mainly on defining the current resources and much less on systematic regional exploration. Regional soil geochemical and geophysical surveys have identified multiple, untested targets along and across strike of the resource. Kaizen believes there is significant potential for additional mineralized systems to exist within the property. 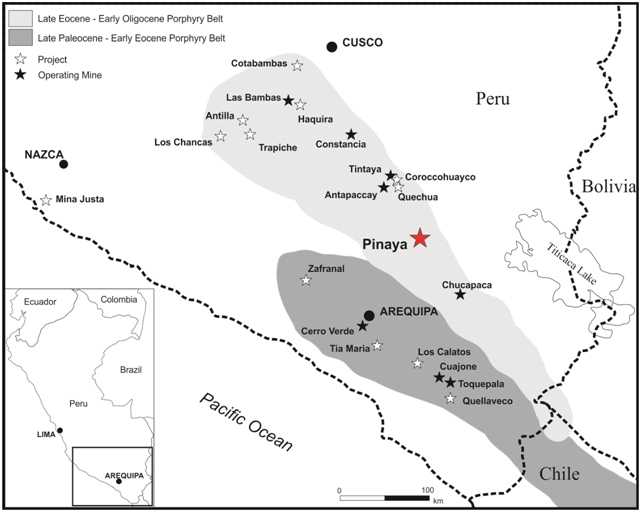 "The planned acquisition of the Pinaya Project is a major step forward for Kaizen on its growth path of assembling a diversified portfolio of high-quality mineral projects in the Americas and the Pacific Rim," said B. Matthew Hornor, Kaizen's President and CEO. "Given the size and quality of the resource delineated at Pinaya, and the significant potential to discover additional mineralized systems, we expect our acquisition of the project will gain the support of Kaizen's strategic Japanese financing partners in furthering the pursuit of Kaizen's long-term objective of delivering key minerals to Japan's industrial sector," Mr. Hornor added. John Fiorino, CEO of AM Gold, stated, "Kaizen has a strong balance sheet, an experienced exploration and development team, and also has access to capital to continue advancing the Pinaya Copper-Gold Project. Completion of this planned transaction will enable AM Gold to unlock Pinaya's present, inherent value. In addition, through a significant share position in Kaizen, AM Gold also will have exposure to the growth of a diversified exploration company. "AM Gold's board and management strongly recommend that our shareholders approve the proposed transaction, and looks forward to Kaizen using its capital and technical resources to begin to realize the Pinaya Project's production potential." Under the provisions of the acquisition agreement, Kaizen will acquire Canper Exploraciones S.A.C., a Peruvian subsidiary of AM Gold. The Pinaya Project is Canper's principal asset. As part of the agreement, AM Gold will receive 15,384,615 common shares of Kaizen -- representing 9.7% of Kaizen's current issued and outstanding common shares on an undiluted basis -- and a cash payment of C$500,000. Post-closing, AM Gold is expected to hold approximately 8.8% of Kaizen's then issued and outstanding common shares, on an undiluted basis. The transaction is expected to close in early September, 2015, subject to the receipt of required approvals. Kaizen also has entered into a concurrent agreement with Rokmaster, under which (i) Kaizen will purchase certain of Rokmaster's equipment located in Peru and (ii) Rokmaster will, among other things, terminate the arbitration proceedings with AM Gold and Canper. The consideration payable by Kaizen to Rokmaster is two million common shares of Kaizen and C$300,000. AM Gold and Rokmaster have been engaged in commercial arbitration since November 2014, seeking to resolve differences regarding payments under a 2012 option and joint-venture agreement that would have entitled Rokmaster to earn up to a 75% interest in the Pinaya Project. Upon closing of the Pinaya transaction, Rokmaster and AM Gold, and their respective Peruvian subsidiaries will release each other from certain claims and terminate both their present arbitration and the existing option and joint-venture agreement between AM Gold, Canper and Rokmaster. AM Gold and Canper will not make any payment to Rokmaster pursuant to the terms of the settlement agreement. reimbursement of certain property-maintenance payments that AM Gold will incur between April 1, 2015, and the closing of the transaction. The total deemed value of the transaction is approximately C$4.5 million. The directors and executive officers of AM Gold who own AM Gold common shares, along with certain principal shareholders, will be required to enter into voting and support agreements to vote in favour of the transaction at AM Gold's shareholder meeting. The Kaizen common shares to be issued to AM Gold are subject to escrow trickle-out provisions under which 10% of the Kaizen common shares will be released from escrow to AM Gold on and following the first anniversary date of the closing of the transaction. A cumulative and further 10% will be released on each three-month anniversary thereafter, ensuring that all Kaizen common shares issued to AM Gold will be released from escrow 39 months after the transaction's closing date. Kaizen will acquire a 100% interest in Canper, whose material asset is the Pinaya Copper-Gold Project. Canper also holds two Peruvian satellite greenfield projects: La Mamita in Corongo province and Minas Luchos in San Román province. The Kaizen common shares to be issued to Rokmaster as part of the arbitration settlement agreement also are subject to escrow trickle-out provisions under which 25% of the Kaizen common shares will be released to Rokmaster on and following the first trading day after the expiry of the four-month hold period under applicable securities laws. A cumulative and further 25% will be released on each subsequent three-month anniversary. The Kaizen common shares to be issued to Rokmaster also are subject to a placement right, permitting Kaizen to arrange the sale of the escrowed Kaizen shares, provided the sale price is at least equal to the 30-day volume-weighted average price prior to such release date. AM Gold will hold a shareholders' meeting to consider and approve the Pinaya transaction no later than September 3, 2015. The terms of the transaction will be described in further detail in AM Gold's Management Information Circular to be filed with regulatory authorities and mailed to AM Gold shareholders in accordance with applicable securities laws. Materials relating to the transaction will be filed by AM Gold with securities regulatory authorities in Canada when they become available. Copies of these documents will be available on SEDAR at www.sedar.com. The closing of the transaction is subject to a number of conditions, including: (i) shareholder approval in respect of both AM Gold and Canper; (ii) the entering into of the voting and support agreements; (iii) approval of the TSX Venture Exchange in respect of both Kaizen and AM Gold; (iv) delivery of a title opinion for the Pinaya Copper-Gold Project acceptable to Kaizen; (v) the entering into of an agreement among AM Gold, Rokmaster, and their respective subsidiaries with respect to the termination of the arbitration and the option and joint venture agreement; and (vi) no material adverse effect upon closing for Kaizen, AM Gold or Canper. This announcement is for informational purposes only and does not constitute a solicitation or a proxy. The scientific and technical information in this news release has been reviewed and approved by C. M. Rebagliati, P. Eng., a Qualified Person under the terms of National Instrument 43-101. Mr. Rebagliati has verified the technical data disclosed in this news release. The Mineral Resources disclosed in this news release are reported in the NI 43-101 Technical Report dated May 30, 2011 "Updated Resource Estimate on the Pinaya Gold/Copper Property, Caylloma and Lampa Provinces, Peru for AM Gold Inc." by Messrs. Brian Cole P.Geo and Ronald Simpson P.Geo. For detailed information about QA/QC procedures, data verification measures and other parameters used to estimate these Mineral Resources, please refer to such technical report that is available on the SEDAR profile of AM Gold. AM Gold Inc. is a publicly held resource company based in Vancouver, Canada. The company is listed on the TSX Venture Exchange under the symbol AMG and is quoted on the Frankfurt Exchange under the symbol AMX. The company is focused on creating shareholder value through the development of its gold and gold-copper projects in the Yukon and Peru while building a portfolio of quality projects in North and South America. More information on AM Gold is available at www.amgold.ca. Forward-looking statements include, without limitation, statements regarding completion and expected benefits of the Transaction and other statements that are not facts. Forward-looking statements are based on a number of assumptions and estimates that, while considered reasonable by management based on the business and markets in which Kaizen and AM Gold operate, are inherently subject to significant operational, economic and competitive uncertainties and contingencies. Assumptions upon which forward looking statements relating to the transaction have been made include that Kaizen and AM Gold will be able to satisfy the conditions in the Acquisition Agreement; that Kaizen and Rokmaster will be able to satisfy the conditions in the Settlement Agreement; that all required third party, regulatory, stock exchange, and government approvals will be obtained; and that the Transaction will be successfully concluded. In addition, the factors described or referred to in the section entitled "Risk Factors" in the MD&A of both companies and which are available on the SEDAR website at www.sedar.com, should be reviewed in conjunction with the information found in this news release. Although Kaizen and AM Gold have attempted to identify important factors that could cause actual results, performance or achievements to differ materially from those contained in the forward-looking statements, there can be other factors that cause results, performance or achievements not to be as anticipated, estimated or intended. There can be no assurance that such information will prove to be accurate or that management's expectations or estimates of future developments, circumstances or results will materialize. As a result of these risks and uncertainties, the Transaction could be modified, restricted or not completed, and the results or events predicted in these forward looking statements may differ materially from actual results or events. Accordingly, readers should not place undue reliance on forward-looking statements. The forward-looking statements in this news release are made as of the date of this news release, and Kaizen and AM Gold disclaim any intention or obligation to update or revise such information, except as required by applicable law, and neither Kaizen nor AM Gold assume any liability for disclosure relating to the other company herein. This news release also contains references to estimates of Mineral Resources. The estimation of Mineral Resources is inherently uncertain and involves subjective judgments about many relevant factors. Mineral Resources that are not Mineral Reserves do not have demonstrated economic viability. The accuracy of any such estimates is a function of the quantity and quality of available data, and of the assumptions made and judgments used in engineering and geological interpretation, which may prove to be unreliable and depend, to a certain extent, upon the analysis of drilling results and statistical inferences that may ultimately prove to be inaccurate. Mineral Resource estimates may have to be re-estimated based on, among other things: (i) fluctuations in metal or mineral prices; (ii) results of drilling; (iii) results of studies; and (iv) the possible failure to receive required permits, approvals and licences.